Sosin and her family moved from rural Turkey to Istanbul, the country's largest city, and for four years she did not leave the house, not even to buy food for her children. 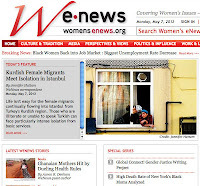 The plight of poor women who have moved to Istanbul from rural Anatolia was among the many sad, fascinating, and empowering stories I encountered while covering the recent 12th Association for Women’s Rights in Development (AWID) International Forum in Istanbul. Arriving late for a studio visit scheduled during the Contemporary Istanbul art fair last fall turned out to be a stroke of luck. 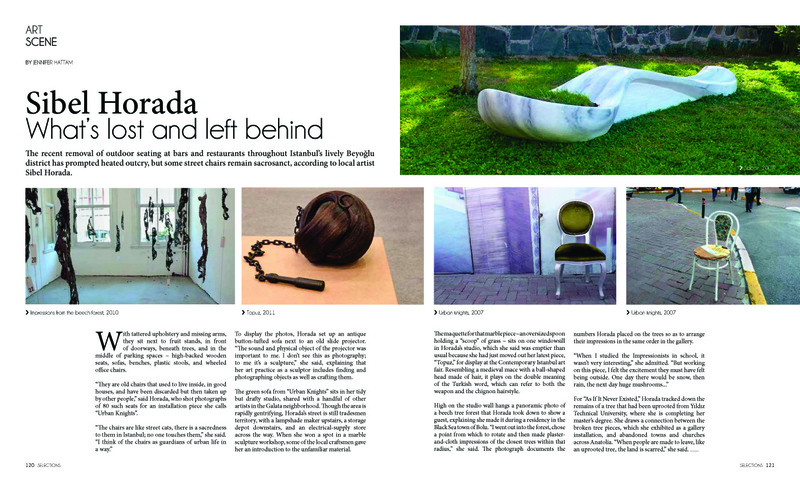 The organized group of art lovers had already breezed in and out, leaving sculptor Sibel Horada free to give me a relaxed one-on-one interview over tea. After a private screening of the old-fashioned slideshow that made up part of her recent installation work "Urban Knights," we lounged on the antique button-tufted sofa that also featured in the piece and chatted about Beyoğlu's mysteriously disappearing tables, the sacredness of street cats and old chairs, sculpting with marble, and learning to appreciate Impressionism in a rainy beech forest. 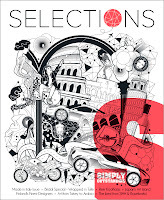 My profile of Horada and her work appeared in the Spring 2012 issue of Selections, following three pieces I wrote on Contemporary Istanbul for the previous issue of the Beirut-based luxury lifestyle magazine.